Our first destination is the town of Rennes des Chateau, a very small hilltop town that was the setting for a book we read last year. The book "Labyrinth" (by Kate Moss) has a large part of it placed in this town and draws upon the actual heritage of the town for part of its plot. This is the main street through the town. Labyrinth is a suspense story that switches back and forth between today and the 12th century. At the end both mysteries are solved. 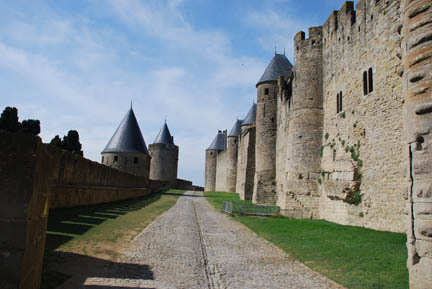 From here we went to Carcassonne, the citadel that was the base for wiping out the Cathars. The Cathars were a Christian religious group that believed that individuals could be holy. And they didn't pay taxes to the Catholic church. So the Catholics mounted a Crusade against them and wiped them out. The last holdouts were in the mountains of southeastern France in villages like Rennes. In 1209 the French king joined the Crusade and this was the end for the Cathars. 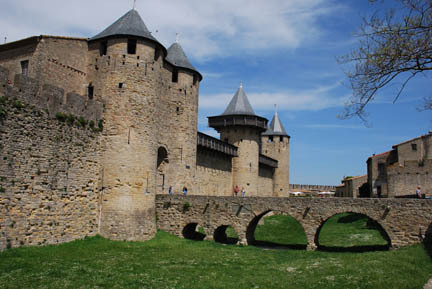 Unlike other walled cities we've seen Carcassonne has two walls around it. A lower outer wall (30-40 feet high on the outside) an inner area to fight from and then an inner wall (another 30-40 feet high). Inside this is the city with its narrow donkey sized lanes. Inside the two outer walls but separated from the town by a moat is the chateau. The builders were VERY worried about attacks with three heavily defensible walls between them and the rest of the world. A few centuries later a Bastide town was created on the other side of the river. This bridge was built to get from it to the chateau. A "Bastide town" is a town created by the King to encourage settlement in the area. 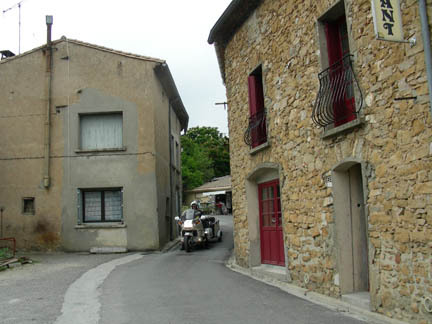 Anyone moving into a Bastide town got special tax credits and other benefits. It was not a walled city, but a "modern" city with square blocks and streets wide enough for two carts to pass. It looks like many of today's cities. From Carcassonne we ran through the hills north to Millau. At this town was the largest traffic bottleneck in Europe. 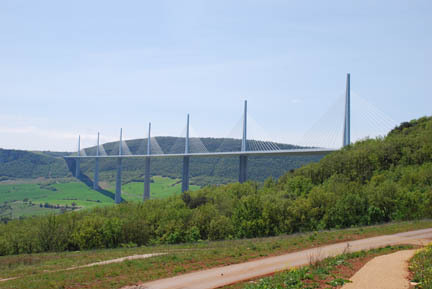 The Autovia (freeway) from Paris to the Mediterranean was pushed onto the 2-lane road that went through the valley at, and the town of, Millau. Then they built this bridge. We watched a program on the Discovery Channel on TV about the construction of it. They built the lower pillars first, then built the bridge deck on the roadway at each end (with the cable pylons on it)and pushed the two pieces of road deck out onto the pillars until they met. The major contractor was the same company that built the Eiffel Tower in 1889. The distance from the river to the bridge is about 1,000 feet. It's a long way down. It's the world's highest bridge. 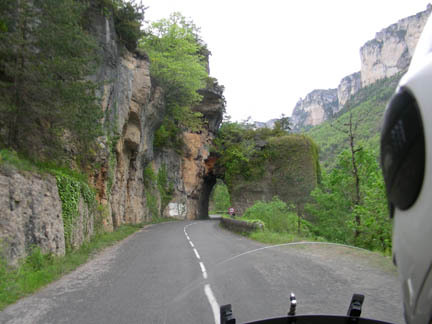 The Gorges du Tarn run upstream from here. We spent two nights here and took a trip up the gorge on the day in between. 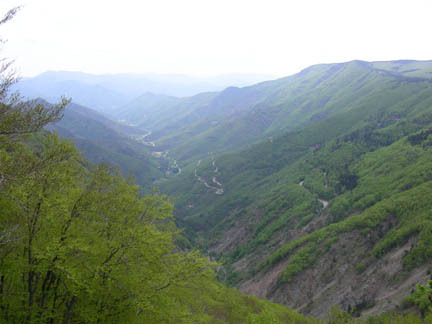 Unlike The Gorge du Verdun we visited last year this road winds along the bottom of the valley. It is at times cut out of the rock and others tunneled through it, sometimes both. 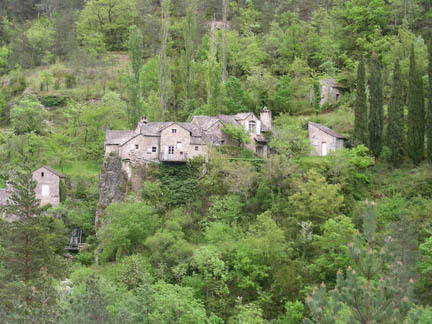 There were medieval villages perched on rock outcroppings above the river Tarn. 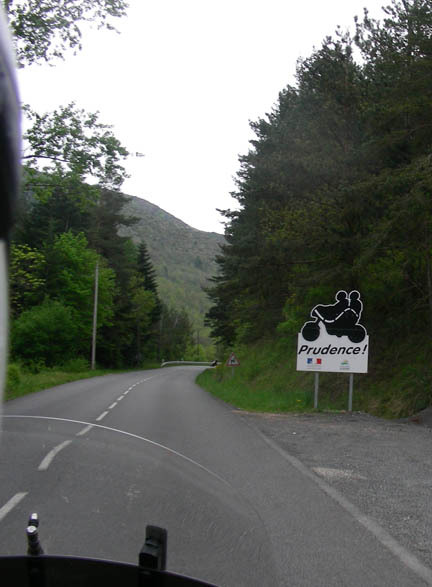 The road is VERY popular with motorcyclists and some of them are young and brave! the river is popular with canoes and kayaks with many rental companies that will rent you the boat and then come and bring you and it back to your starting point (where your car is). Just upstream from Millau the river forks into two rivers. Each has it's own gorge. We went up one and down the other crossing the mountain in between. That's our road down there. Now it's on to the Loire Valley.